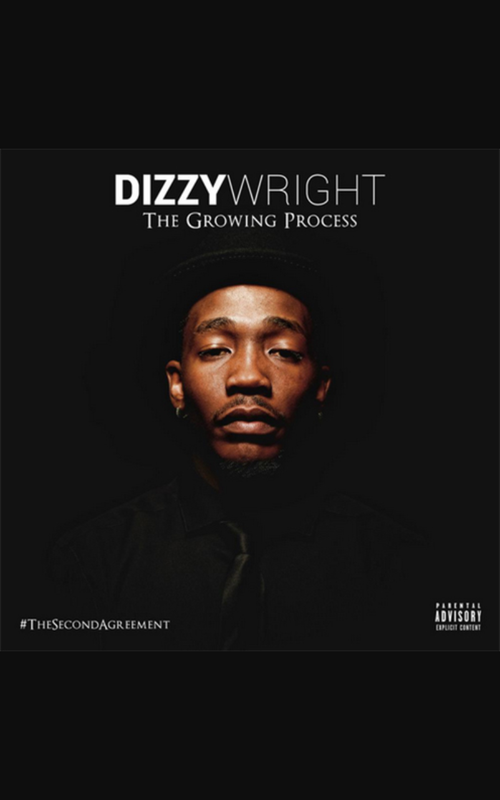 My first listen of Dizzy Wright’s album “The Growing Process” was a textured one. It displays huge growth in Dizzy as an artist himself. He has plenty of tracks for all crowds of his audience the stoner crowd, the conscious crowd, and the party crowd. His strength is not in lyricism to say, but in creating a understandable message like in songs “False Reality” and “Train Your Mind”. In these songs it’s all about one’s mentality to certain situations that he creates in these songs or the vibes he gives out. He seems to try and succeed at making an industry sound single “Floyd Money Mayweather” for the album which gave him buzz while a contradicting sound from his previous single “Train Your Mind”. I personally felt misguided when I heard the single being so different at first I didn’t know what direction this album would go in, but releasing this single was perfect timing for Dizzy as he had both eventually played on ESPN to help hype the Mayweather vs Pacquiao fight. The album has a real attention grabbing intro “Higher Learning” which was a great start to the evolving project. “The Growing Process” had production that really matched Dizzy’s style for every song and made smooth transitions throughout the album. While the production was good Dizzy used multiple producers to achieve his whole sound and a highlight to me was the track produced by Hopsin “Explain Myself” featuring the Funk Volume crew. Not only did this song have strong features by the members, but showcased Hopsin’s producing which I feel lacked a little on his Knock Madness album then again it has been a couple years and Hopsin himself has grown as an artist. Features on this album were mainly good, but I feel the feature by Berner on “I Can Tell You Needed It” didn’t add well so it subtracted from the song and wasn’t a strong feature like others. Dizzy had his Funk Volume members feature along with artist Tech N9ne, Mod Sun, Big K.R.I.T, Chel’le, Irv Da PHENOM!, Lazyie Bone, Krazyie Bone, and Njomza on the album. While listening I felt Dizzy creating an Old-School vibe with a modern day sound wanting to relate back to the “Golden Age” in hip-hop. While this was only a first listen review I can tell already this album is a big step forward in Dizzy’s career as an artist. I don’t have a rating system set up for album reviews at the moment because making this was an in the moment idea, but I plan on having one in the future. All I know is that I would definitely support this album if you are into well crafted Hip-hop albums. P.S Please make sure to check out other post on this page! Thanks! This entry was tagged Albums, Dizzy Wright, Funk Volume, Hip-hop, Music, New, Rap, Reviews, The Growing Process, West Coast. Bookmark the permalink.